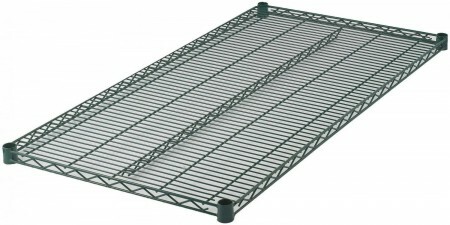 Winco VEX-2430 Epoxy Coated Wire Shelf 24" x 30"
TigerChef > Storage > Restaurant Shelving > Wire Shelving >< Wire Shelves > Winco VEX-2430 Epoxy Coated Wire Shelf 24" x 30"
$21.99 Royal ROY S 2430 Z Polycoated Zinc Wire Shelf 24" x 30"
$48.99 Advance Tabco EG-2430 Green Epoxy Coated Wire Shelf 24" x 30"
$20.42 Winco VC-2430 Chrome Plated Wire Shelf 24" x 30"
Use the Winco VEX-2430 Epoxy Coated Wire Shelf 24" x 30" to provide additional storage space for keeping tools, equipment and other essentials easy to find and conveniently accessible. Designed for commercial and industrial use, this shelf component is exceptionally durable and is constructed from heavy-duty high quality wire. This shelf can hold weight of up to 850 lbs. and is great for keeping your premises neat and organized. Built to endure a wide range of temperatures from -100° to 500°, this wire shelf is suitable for use in all types of environments including humid areas. To prevent dust and dirt accumulation, this shelving unit component is coated with a bright epoxy finish that will keep your shelves in good condition even after years of use. For added convenience, this wire shelf is easy to set up, and does not require any tools during assembly. Simply attach the shelf to your post using the included (4) sleeve clips. This wire shelf is sold in multiples of two.